It's now live in 12 territories across the globe. You probably already have a credit card associated with your Apple ID to pay for any app, music, movie or book. But if you want to use your PayPal balance or just prefer paying for everything via PayPal, you can now do just that. 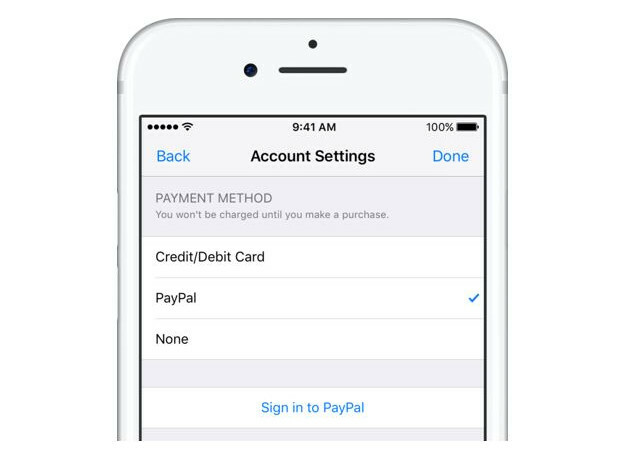 Starting today, you can use PayPal for any iTunes, App Store or Apple Music transaction made through an iPhone, an iPad or an iPod using your PayPal account. PayPal promises to make the feature available in other locations, including the US "soon after," though it didn't give a timeframe for the rollout. The feature is now available for iOS users in the US, UK, Canada, Mexico, Australia, Austria, France, Germany, Israel, Italy, the Netherlands and Spain. To use PayPal, you simply have to add it as a payment option under account settings. Make it the default if you'd rather use it than your card on file, and it will work even if you make your purchase through an Apple TV or an Apple Watch. It will even bring PayPal's One Touch mobile feature to those devices, which means you only need to authenticate transactions made through the TV or the Watch with your fingerprint. Cool, if that makes things more convenient for you, but dangerous if you have the tendency to buy impulsively. Update: Changed parts of the story now that the feature is live in 12 territories.